Here are 5 tips to make your reception fun for everyone. One of the worst things you can do is plan too many events into your wedding reception. Stick to the traditional ones such as the toasts (complete with wedding sparklers showering the happy couple), the first dance (a great place to shower the couple with wedding confetti and bathe them in the glow of our 20-inch sparklers), and, of course, the cake cutting (don't forget the wedding cake sparklers for adding that touch of magic). Others events should include the parents' dance, the bouquet toss, and the final exit. Too many events tend to eat into dance time and, if you are paying for the band or DJ by the hour, your wallet. It is so easy to get carried away and go over budget when putting together the reception. Nothing is more likely to ruin your wedding faster than stressing about how you are going to pay your bills. 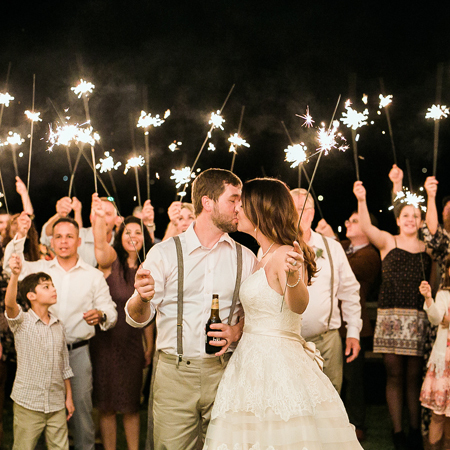 At Wedding Sparklers Outlet, we offer bulk pricing on our entire selection of sparklers and wedding confetti cannons to help you add the magic to your special day without killing your budget. Of course, you want to wear those killer new heels for your wedding, they complement your dress, and have 3-inch heels, and those cute, long, pointy toes. But, they are only comfortable for about an hour, maybe two at the most. When it comes to your reception, the experts all agree you should grab a pair of flats or perhaps even some sneakers to keep your feet more comfortable. Otherwise, it's going to be a long, painful night. There is nothing wrong with planning some of the music for the DJ, but only a small amount. Any good DJ knows how to read the crowd and adjust the music they are playing to suit the mood and to keep people out on the dance floor. The first dance is the perfect time to hand out confetti cannons and sparklers to the guests to help add a touch of magic to this special moment. Our sparklers burn smoke-free and are suitable for indoor use. When it comes to making sure your guests have a good time, remember that they are going to take their cues from you. As long as you appear to be having a good time, they are going to be doing the same thing. Be sure you spend lots of time on the dance floor, partake of the food and beverages, and be generous with the wedding sparklers and wedding confetti cannons from Wedding Sparklers Outlet.